is Atlanta Journal reporter George Goodwin. George Goodwin, now 93, was honored on March 15, 2011 by Central Atlanta Progress, the city's downtown business development association. He received the Dan Sweat Award for his lifetime of civic involvement at the association's annual meeting held on the property of the World of Coca-Cola. 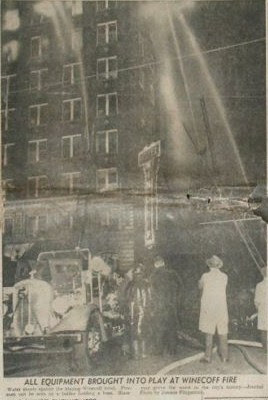 As an Atlanta Journal reporter in 1946, Goodwin covered the Winecoff fire. He was never convinced the fire's origin had been properly investigated by city officials. Two years later he won the Pulitzer Prize for Distinguished Local Reporting for his series of Journal stories that exposed a voting fraud conspiricy in Georgia. His career as a newspaper reporter and later as a public relations executive gave him many oppotunities to assist Atlanta's growth. He spoke to a large and grateful crowd upon recieving the award. Georgia's governor and the city's mayor also spoke at the event. George Goodwin is the father of Winecoff Fire co-author Allen B. Goodwin.